This looks nostalgic, I love it. A fave now. At times only what someone else sees can teach you what you should be looking for. I love learning. wonderful, wonderful, wonderful. 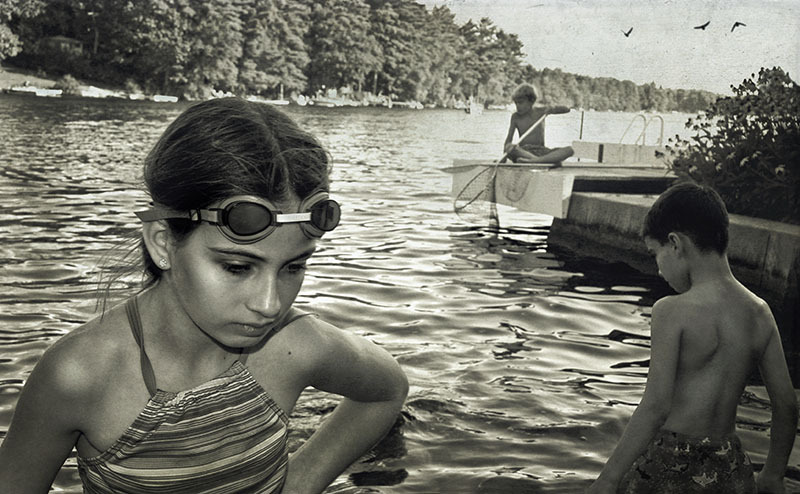 slightly sally mann - which is a very good thing. beautiful, a surreal dream of a memory. Just beautiful! I love the tint of color and texture in the background. Three flying birds and three young children really is a fantastic composition here. And the fact that the kids form a triangle makes it a very strong layout. This is a novel of a photo. It belongs in an exhibition for people to stare at. spectacular image with its accompanying words. First off - this photo is just breathtaking. What an amazing moment. The brief poem completely underscores it. This is lovely. Very sadly nostalgic for me. Just an incredibly balanced photo, perfect done... really quite astounding. This is downright magical. It perfectly epitomizes (is that a word?) the essence of the words you posted with it. Wonderful. I like that the different elements of this image are each on a different plane (if that makes sense). It has layers for our eye to see without anything on top of the other (the birds, the dock, the different children). Expressive. What a killer poem!!!!! Proudly hosted by Sargasso Networks. Current Server Time: 04/21/2019 02:39:19 AM EDT.